Military fast jet-demonstration teams, although expensive to operate –esp.for airforces hit by shrinking defence budgets- are the ideal instrument to present their air forces and countries during (national and international) public relations related events, to boost public awareness and military recruitment bus also to create and accentuate the internal cohesion within the national military community. 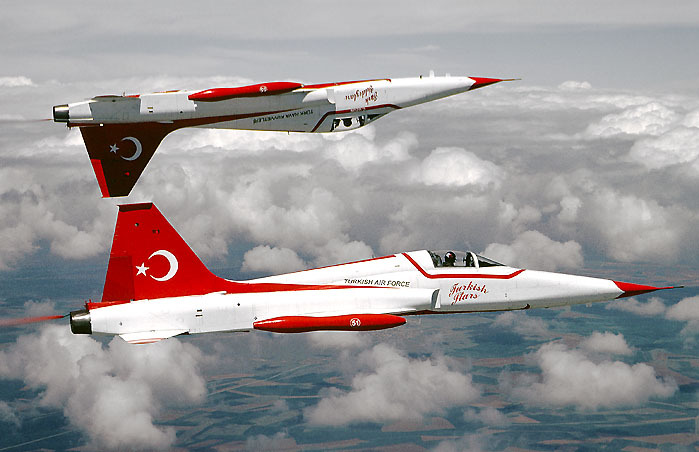 Having seen the creation of several small-size demonstration teams since the early fifties the Turkish Air Force (Türk Havva Kuvvetleri/THK) created in November 1992 the ‘Türk Yildizlari’ (Turkish Stars) demonstration-team, flying seven Northrop NF-5A Freedom Fighter supersonic aircraft. Nowadays flying up to 90% of its annual demonstrations in Turkey, this team is gradually becoming THK’s main national PR-asset, witnessed by an increasing popularity and reputation within the Turkish population and a true idolizing within the THK-community. 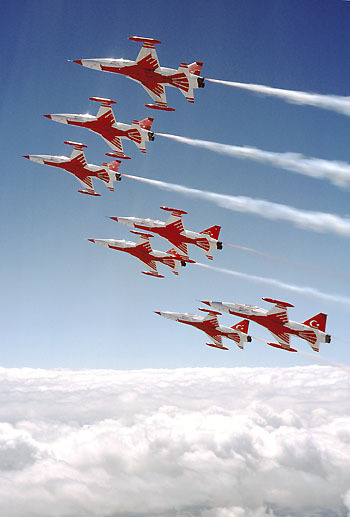 pilots, all assigned as pilot instructors to 132 Filo, based at Konya in Anatolia, were sent to Canada, Italy and the United Kingdom to gather demo-flying experience from these world-known demonstration-teams (Snowbirds, Frecce Tricolori and Red Arrows) prior to their actual flying training. 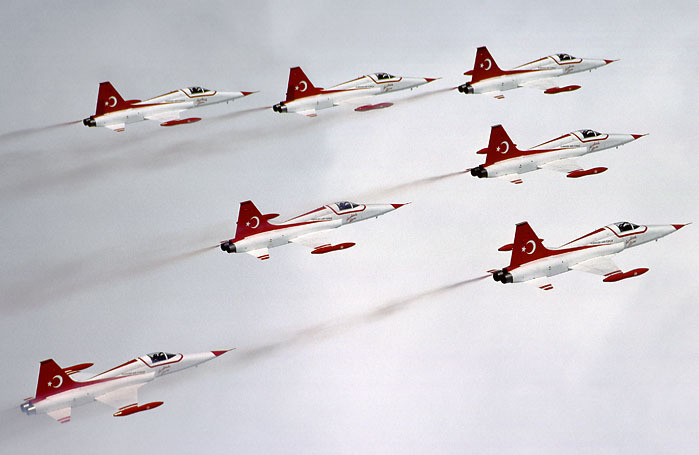 After months of instruction and preparation, the team performed its ‘seven-ship’ maiden-demonstration at Diyarbakir in October 1994 and became world’s youngest supersonic aerobatic display team. 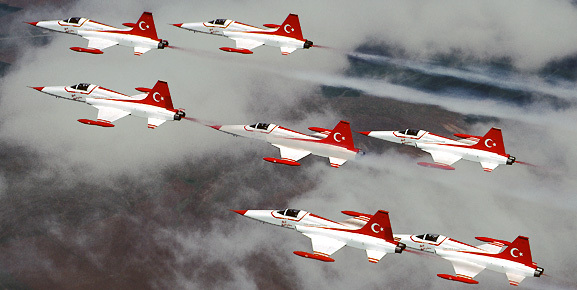 Having performed for the first outside Turkey at the official 1995 Belgian Air Force AirShow at Kleine Brogel, the team’s capabilities were ‘revealed’ to the world of military aviation at the internationally wellknown International Air Tattoo at RAF Fairford (UK), the traditional annual meetingplace of the world’s aerobatic elite. After their demonstration, the TurkishStar-pilots were congratulated by the commander of RAF’s RedArrows, impressed by the high-standard of their aerobatic programme, only been created in the ‘Stars’-briefing room one year earlier. 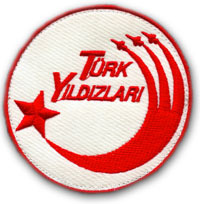 Having succesfully ‘survived’ its first years of operations, the Türk Yildizlari Akrobasi Timi obtained an independent status on 11/01/1997 by becoming 134 Filo, still based at Konya. 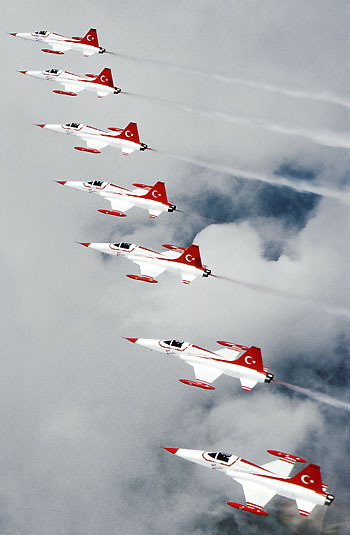 Composed of thirteen officers, including a commentator,　the programme of the TurkishStars consists of a delta formation of seven aircraft and a four-ship aerobatic routine, depending on meteorological conditions and the display area. 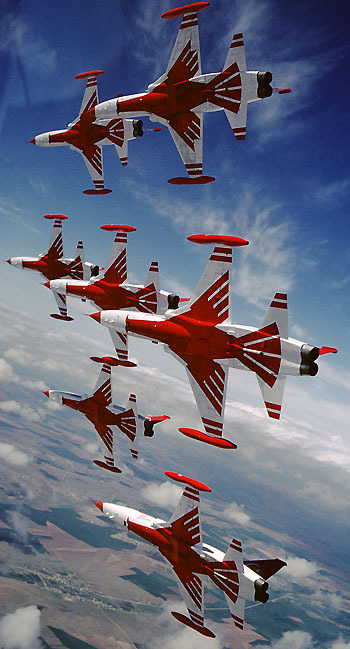 In 2000 twenty-five displays are planned, including international displays in Austria, Bulgaria and Romania. 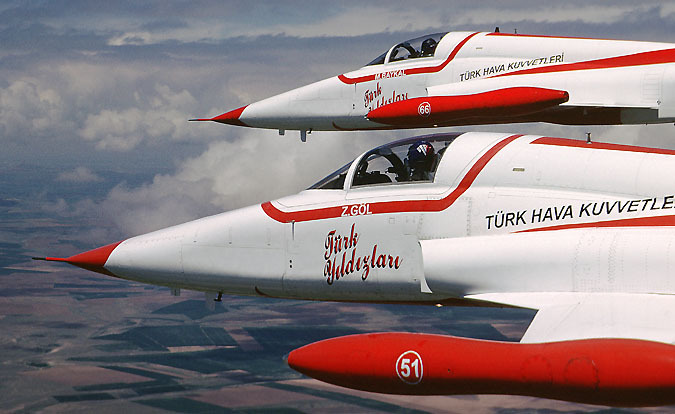 Similar to other aerobatic display teams, the Turk Yildizlari need to select and train new pilots. 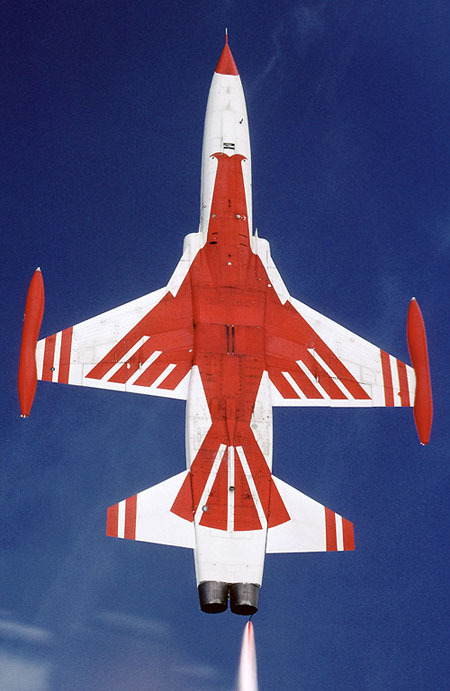 In order to become a TurkishStar-teammember, pilots needed to log at least 300 hours flying time on the NF-5A/B Freedom Fighters or 800 hours flying time. Formation-leaders have flown at least 800 hours of the NF-5 or 2000 hours total flying time. 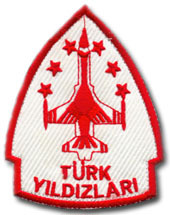 Since nowayads only co-located 132 and 133 Filos, responsible for weapons and tactical training (132Filo) and the combat training for new pilots prior to their conversion on the F-16 Fighting Falcon (133Filo), the TurkishStar-Staff and selection-board can easily detect suitable candidates. Due to the highly important public relations missions of the unit, candidates are also screened on moral and character capabilities. 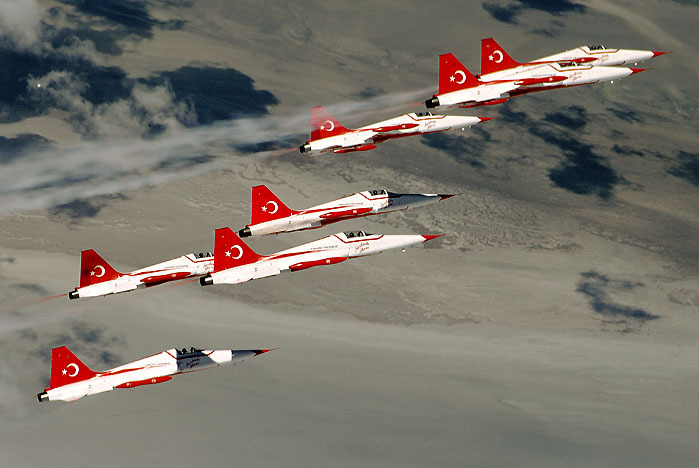 Once selected to join the TurkishStars, each new pilot is given a one-year ‘step-up’ training programme, based on close formation flying. During this intense step-by-step training programme, starting with two-ship formation flights, all trainees, flying two missions a day, are evaluated at all times by the various ‘TS’-instructor pilots. In order to retain their tactical capabilities and flying skills, all demonstration-pilots occasionally fly tactical missions (incl.air/ground firing) with Konya’s tactical F-5 fighter-squadrons (132 and/or 133 Filo). Having received its Northrop NF-5A/B Freedom Fighters, from Royal Netherlands Air Force stocks becoming redundant after the introduction of the F-16 Fighting Falcons, in the early nineties, all aircraft assigned to the Türk Yildizlari received only minor smoke-generating modifications. These Canadian-built second-hand aircraft were preferred to the initially delivered American-built F-5A Freedom Fighters due to their extra leading edge flaps and more powerful engines. A locally developed smoke-system was installed by TuAF’s Air Logistics and Maintenance Centre (1nci Hava Ikmal Bakim Merkezi Komutangli) at Eskisehir. The aircraft’s tiptanks were modified as smoke tanks, using a internal long pipe from the tips to the nozzle exhaust. 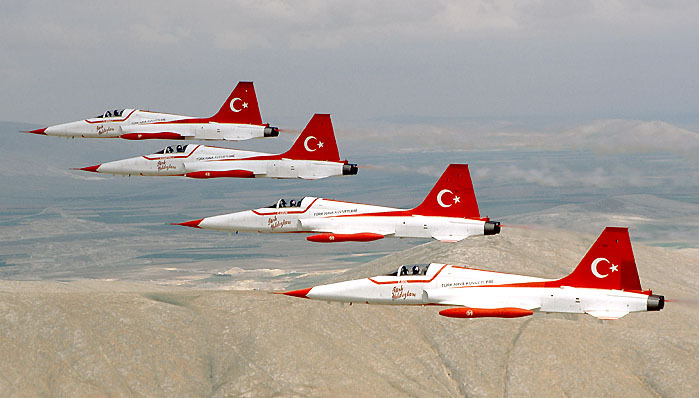 Restricted to –3,5/+7,33 G-manoeuvres, the NF-5A/B aircraft, currently used by the TurkishStars, will see the end of their operational live in 2008, only to be replaced by more modern and capable Lockheed Martin F-16C Block 30 Fighting Falcon-fighters. These F-16C Block 30’s are already in operational service with the various tactical squadrons of the Turkish Air Force and gradually replaced by more modern Block 50 Fighting Falcon.